Photos from early Friday morning showing the arrival of one of Metro’s new Kinkisharyo P-3100 rail cars. Once testing is complete, the cars will be placed in service when the Gold Line Foothill Extension and the Expo Line Phase II open. More news to come on the former project later this week. The sound of engines idling and car horns blaring were replaced by the sound of derailleurs quietly whirring and folks having a good time at CicLAvia: Heart of L.A. on Sunday. It was the fifth anniversary of the car-free event. The next confirmed CicLAvia will take place in the San Fernando Valley in March 2016. CityLab talks to Stephen Fleming, the author of a new book, Cycle Space, which holds no punches when it comes to designing a city made for bicycle transportation. 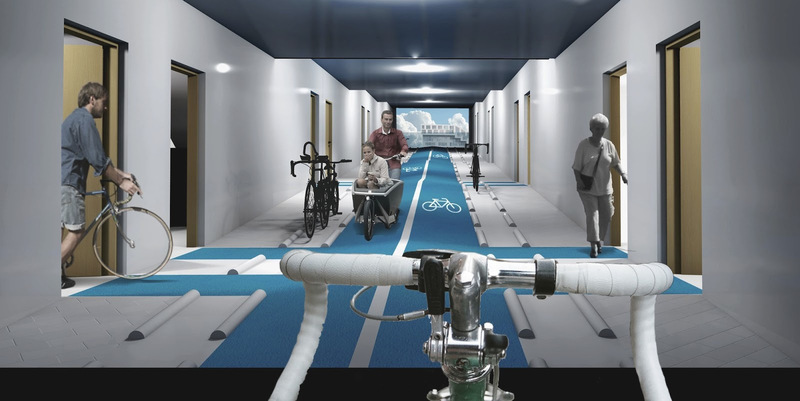 Unlike most conceptual designs for bike-friendly designs which might feature a few bike lanes, racks or barriers, the concepts Fleming puts forth are much more striking — if not highly idealistic. Holland’s hopelessly uncompetitive bike infrastructure … [is] only the best in the world because the rest of the world hasn’t tried yet. [As long as] Dutch bike infrastructure is held up as a model, the rest of the world will not take bicycling seriously. Why would the US, for example, invest in a mode that is only going to get them to work sopping wet? They have already invested in a mode that gets them there dry. Why would Australians want their taxes spent building bike tracks if the prize at the end is commuting long distances on horrible Omafietsen? It’s certainly interesting as a concept. But it’s probably no more than that, since it seems highly implausible in the existing urban environment. Even if we could build a city from scratch, history should tell us to be wary of designing cities around a single mode of transportation. In more realistic bicycle infrastructure improvement news: members of the L.A. City Council and Metro Board Members Mayor Eric Garcetti and L.A. County Supervisor Sheila Kuehl pledged on Thursday to give $6 million to connect 12 miles of disconnected segments of the Los Angeles River Valley Greenway bike path in the Valley. The pledged funds will be used to get the project off the ground and “shovel ready.” Though it’s still a long-way off, once the project is completed, it will be possible to walk or bike along the L.A. River interrupted between Elysian Valley to Canoga Park. Los Angeles gets a nod in this brief piece highlighting how three U.S. cities are working to reduce reliance on cars. L.A. is mentioned specifically for Mobility Plan 2035 passed by the L.A. City Council in August. The other two cities in the article are Oklahoma City and Salt Lake City. Interestingly, according to the article, Oklahoma City’s active transportation initiatives were a result of the city’s push on fitness after the city was ranked as one of America’s fattest cities. Salt Lake City’s push for transit began in preparation for the 2002 Winter Olympics. More recently, the city opened one of the first protected intersections for bicyclists in the country. There’s a big shift underway in how business travelers are getting around town. KPCC reports that since 2014, the number of business travelers using ride-share services like Uber and Lyft has surpassed those taking taxis and using rental cars. The study reached this conclusion by looking at 8 million travel reimbursement expense receipts from the last year. The receipts show that in early 2014, both rental cars and taxis were used by business travelers much more than ride-share, which at the time only accounted for 13 percent of travel. Now, ride-share companies Lyft and Uber account for 42 percent of ground-based business transportation. Meanwhile rental car use fell to 31 percent and taxis to 28 percent. One reason for this shift could be because more large companies have added Uber and Lyft to their approved vendors lists. Oct. 15: L.A. as a city of dreams, thoughts on fare structure, USC’s transit subsidy cut and potential effects on employee commuting behavior, more affordable housing and possible reasons for transit ridership decline. Oct. 14: update on new platform for Silver Line at Union Station, where does the money go that is left on TAP cards that expire?, post mortem on the techie luxury bus in San Francisco that went belly up. Oct. 12: transit stations and gentrification, the residential rise in DTLA, cool map showing where the jobs are in our region, the impact of Metro fare increases on ridership on the different rail lines. Oct. 9: shade versus bus shelters in our region, pics of the community replaced by L.A. Union Station, a greenie looks at the issue of whether should we love or hate self-driving cars. Oct. 8: more buzz on a potential ballot measure and potential transit projects, why guys lie about carburetors, a transit Armgeddon below the Hudson and Lex Luthor’s plans for the West Coast. Metro is on Twitter, Facebook and Instagram. Joe is on twitter @joseph_lem. This is an even more reason why stored value on TAP cards should be expanded not just to pay for public transit rides, but to also partner with private sector companies like Uber and Lyft to be used to pay for their rides. I don’t see why this can’t be done here when there are perfectly good examples around the world of contactless transit cards being used to pay for taxi cab fares. Use your Octopus Card (the TAP card equivalent in HK) to pay for your taxi cab fares! This would work if there was a way to segregate the pre-tax funds aimed at transit use that some have on their TAP cards from the non tax-advantaged “purse” on the card. Should be a simple software issue, but then the TAP equipment can’t figure out how allow SMBBB to take $2 off cards for Rapid 10 rides, only $1, and then customers are expected to pay the difference in cash. TAP card certainly can be used to pay for cab or ride-share rides. Japan and South Korea are another example of countries that has expanded uses of transit cards. 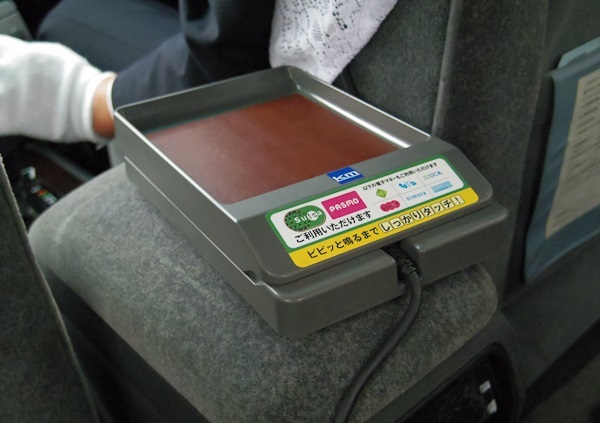 Taxis in Japan accepts the Suica/PASMO card or other compatible transit cards (ICOCA, Kitaca, etc). The cabs can be in special Suica livery or taxi cabs have stickers on them on what form of payment they accept, and they all have contactless card readers installed. Cabs in South Korea, same thing. 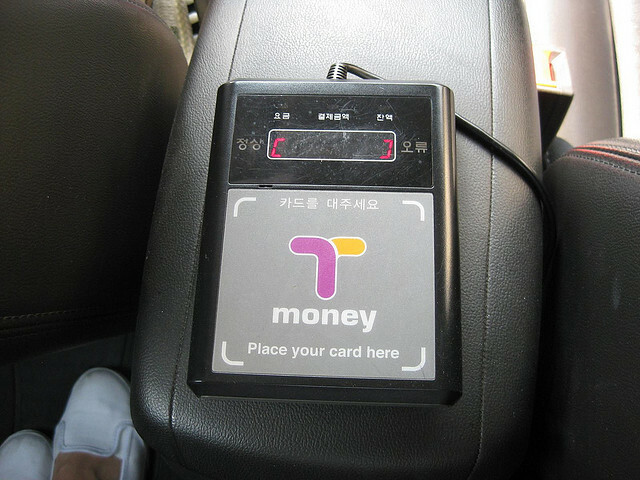 Cabs have signs that they accept the T-Money Card and they all have contactless card readers installed. There’s certainly nothing different in technology between TAP with Suica, T-Money or Octopus cards. They’re all NFC contactless transit cards. If Japan, South Korea, and Hong Kong can figure this all out, there’s no reason why TAP can’t do the same thing with just a little programming work.